The 2019 CNY Fiber Arts Festival will place special emphasis on the art of knitting. Three special guest artists have been selected to provide free lectures and demonstrations on various aspects of knitting. Diana’s Fair Isle talk will begin with a history of Fair Isle Knitting, touching on the symbolism of some of the patterns and discussing where and how it began and the wool that was and is now recommended and used. It will also cover the difference between Fair Isle and other examples of stranded color work. Real samples will be available. Diana will go into colors and pattern choices, talking about using the colors in nature, incorporating the color wheel, and the technique of stranded color work knitting. The dreaded "steek" and cutting your just created artwork will be addressed, along with how to hold the yarns while knitting, dominant and background colors and how to determine which is which. In this presentation, Laryssa will be demonstrating the basic knitting stitches - knit and purl - and how by combining these two, many other designs and patterns can be created - i.e. seed, moss, and basket weave stitches. How to make cables will also be covered. Laryssa will have many samples to view and handle and will also have needles and yarn available for anyone wishing to give knitting a try after the presentation. The yarn and fiber business has changed drastically in the past ten years. What has happened and what do we expect in the near future? Do we need brick and mortar stores? What happens once they are gone? How do they fit into the community and what should you expect when buying from your local yarn store? What happens if you have problems with your project? What are retailers looking for in the industry? You may know the perspectives of growers, dyers, spinners, or weavers, but what about the retailer? If you don't have a retailer you trust and who looks out for you, you need to find one. The Mom and Pop shops are gone - and now we have more sophisticated retail shops that include not only yarn and instruction but networking, designing, events, weaving, spinning, and people in the fiber world who are as enthusiastic as you are. Diana Schwab, also known by her given Dutch name of Gerdina, immigrated to the US with her parents when she was a young girl. Knitting was always a part of her culture with her grandmother knitting mostly socks for the family. Her Mom was also proficient in the art as well as crocheting and sewing. As a young girl she picked up the knitting needle and yarn. With her Mom at her side she learned to knit. She made different things here and there but was not very serious about the art until her grandchildren started to arrive. From then on knitting became a passion. About five years ago a Ravelry friend suggested she look into doing the TKGA (The Knitting Guild Association) master knitting course. This is an on-line course and a committee of master knitters examines the submissions. If something needs to be improved on the item is returned for resubmission before one is allowed to move on to the next level. Almost everyone has to resubmit something. After three years of working on the course full time she earned her title of Master Knitter in Oct. 2016. The course consists of three levels with each level emphasizing a specific aspect of knitting. Lots of research goes into doing the course since you learn everything on your own. Reports and lots of knitted swatches are a requirement for each level. It's really something like a college course. Although Diana has knowledge and skill in several types and styles of knitting, Fair Isle is by far her favorite. As a matter of fact, she designed and knit a Fair Isle sweater as one of the requirements to complete the Master Knitting course. Her desire is to visit the Fair Isle and all of Great Britain someday. Diana lives in New Berlin with her husband and cat. She has two adult children and four teenage grandchildren. Laryssa was always interested in crafts as a young girl – i.e. sewing, embroidering, crocheting, and finally knitting. She taught herself to crochet at 16 (with how-to books) and was taught by her Scottish mother to knit “British style” at age 18. 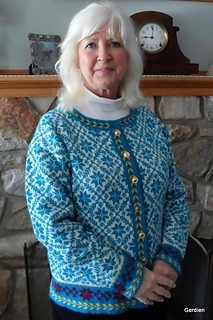 Knitting did take off with her until her 30’s, when she was working as an RN in the operating room. It relieved the stress from working long hours and being on call. During that time, Laryssa also took several knitting courses from Parsons School of Design in N.Y.C. Retired, today she has her own line of designer yarns in natural and dyed colors utilizing both natural and chemical dyes. She also operates her own custom knitting service. Susan Miller is the owner of the Yarn Cupboard in Jamesville, NY which has been open for ten years this April. Susan has had varied careers while living in Malaysia, New York City, Taiwan, and Australia, but fiber was always her first love. Many of you may remember the Knit Nook in Dewitt where she work for four years through high school many, many years ago. That provided the start of her stash that traveled around the world with her. Susan also has been sales representative for a number of boutique yarn lines in the Northeast.